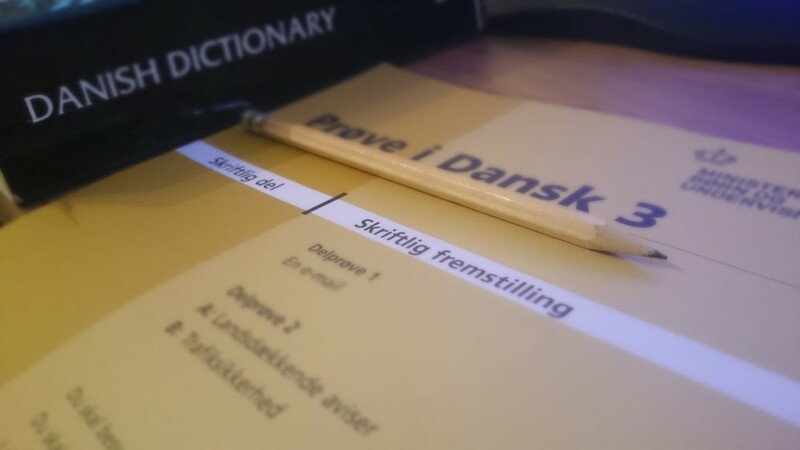 I’ve not written all that much about my time learning Danish, which is odd given how huge a deal it’s been for me since moving to Denmark. I was never one for languages; given the chance to jump ship from French to Latin after three years in high school I took it, getting to start over and therefore have an easier ride. Perhaps not all would agree to Latin being easier than French but I certainly found it more enjoyable given it also focused on Roman culture and we had a teacher who would happily take us out to sit beneath the trees for our lessons in the summer time. Thanks Mr Redmond! So the idea of starting up a new language at the age of 38 was a little daunting, and when Linda suggested I take the state organised free classes for us ‘new Danish’ I was rather resistant. Perhaps I found the idea of spending time with a bunch of strange foreigners a little off putting, despite the fact that I too was just as strange and foreign. It’s a curious thing this being a minority immigrant. But I’ve never shied away from admitting when I’ve been a fool and that resistance was such a time. My years at language school have been nothing but joyful from the start. I’ve met so many people from so many different places, from the more expected Germans, French and Polish, to the more far flung Nigerians, Kenyans, Burmese and even one guy from the Cook Islands! Oh and a fair few from that curious island that lies in the North Sea funnily enough. And then there are the teachers, four of whom I’ve had the pleasure of their teachings on a fixed basis. All have been truly fantastic, not to mention incredible patient with me! Oh and I guess you could say we’ve had some fun along the way too, the British and Danish humours are not exactly opposites. And the fact they have all been women hasn’t hurt things one bit 😉 In many ways language school has become my ‘happy place’ here in Denmark. Something to look forward to whilst I’m cleaning my umpteenth toilet during the working season, or the bright light shinning through the long dark nights of the Danish winters. I’m always counting the days. But today things have started to enter their final phase. I’ve just come home from taking the first half of my final exam, in this case the written half also known as trial by fire! I have the oral exam next month, but that’s basically just talking to people so nowhere near the stress levels of this first half. Technically I shouldn’t be stressed at all. I didn’t start this journey to obtain a qualification as such, it’s purpose was simply to become good enough in Danish that I can communicate with people, as anyone who chooses to live in another country should. And so the grade I get isn’t important to me. Or rather it wouldn’t be if it wasn’t for the fact that I can’t help feeling it will reflect upon my teachers, and on that score I can’t stand the idea of letting them down. Sadly I fear I have little chance of excelling, but if I can just nab a middling pass that shows even an old dog like me can be taught new tricks I’ll sleep easy. We’ll just have to wait and see on that score.